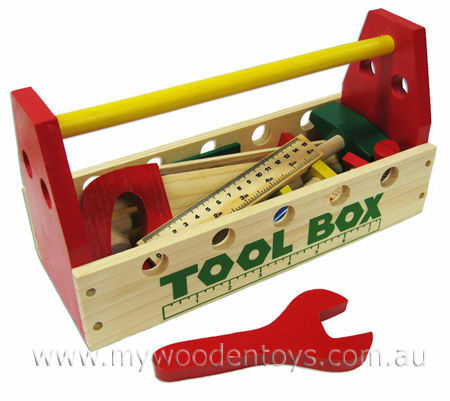 Toy Tool Box is a great colourful collection of chunky pretend tools in a practical strong carry around tool box. With 24 large pieces for little fingers this is a great first tool set. The set comprises of a Screwdriver, Spanner, 2 Hammers, 5 working bolts, 1 Saw, 2 chunky nails, (not sharp), Ruler and 4 Construction pieces to attach the bolts and nails to. The tool box itself has holes in it that the bolts and nails fit into, so the box itself is a project in itself as well as a portable storage solution. So now there is no excuse for not getting those DIY jobs around the house done! Size: Tool Box is 28cm by 11.5cm by 15cm. Hammer 16cm, Bolts are 8cm long. We like this because: "It is a well thought out toy and a great first tool set that can be carried around to help Mum or Dad (depending on who does the DIY in your house!)."